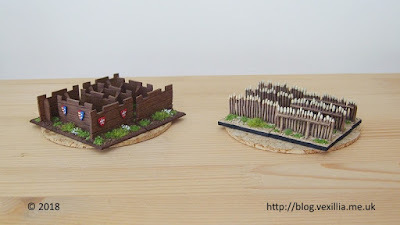 In April I saw an offer on TWW from Alternative Armies for a bundle of 40 mm frontage wall sections in five different styles that was too good to miss. I ended up with a total of 2.4 m (yes metres!) for only £20.00 delivered. The sections on the left are for my Later Polish army and those on the right are for my Timurid & Islamic Persian armies (hence the different basing schemes). For the Polish pieces I customised two sections by the addition of some shields from my spares box. I painted one with the Polish eagle and another with my favourite Polish clan colour scheme. I could only fit two stars on the latter; there should be seven. If I were to do more like this I'd go with only one slightly larger star. The sections are cast in a very light resin which is easy to clean up. There's very little flash and the detail is deep enough to make them easy to paint. I painted the major details (wood grain etc) by brush and followed this with a few dry brushed layers and finished with a brown wash. The stakes are based on MDF with added magnetic vinyl. As a result they are a little light and I wonder if the may be too light to stay in place on the tabletop. This won't be a problem with the Polish sections as they a based on metal bases. To date I've used 8 of the 12 wooden wall sections and 6 of the 12 of the stakes. I plan to use some stone wall sections next as part of some new medieval baggage elements. Even so I think I may have bought a lifetimes' supply! If you're tempted there's a similar offer currently available for £18.00 plus postage. The devices were used by Heraldic clans. Herb is the generic Polish term for a coat of arms. So I suppose you can use either. On reflection it could also be both: Polish clan herb.